$Stream Music – Use your favorite Bluetooth device to stream music from iTunes, Spotify, Pandora, YouTube. Bluetooth Connection – You can wirelessly connect and play from your phone, tablet, laptop or desktop pc. Devices without Bluetooth capability can be connected via the 3.5MM Aux Input. Clear Sound – With 3 active speakers and one subwoofer you will enjoy dynamic high quality audio in the comfort of your home or office. 4 EQ settings: Normal, Jazz, Rock, Pop for the best sound. Innovative Design – Use the built in dock to hold your phone or tablet while you stream music or audio. Sykik TSME26 2.1 Channel Bluetooth Tower Speaker System with Subwoofer, Red & Black Step up to a higher quality in sound and design. This powerful Tower speaker carries a 6.5" sub-woofer along with a pair of 4" satellite speakers for deep and clear sound. Total of 60W RMS power (36 2x12) insures a great listening experience. The high gloss piano finish and high tech design demands complements from your guests. Play your music through Bluetooth, SD card slot (MP3), USB flash drive (MP3) or just connect through the 3.5mm AUX input jack. Full function remote is also provided for easy use. Innovative Technology Slim Tower Bluetooth Speaker, 36-Inch Tall ITSB-100 Innovative Technology Slim Tower Bluetooth Speaker Manufacturer refurbished in Like New condition in original packaging with 90 Day manufacturer warranty. 30 Day hassle free returns. This slim profile tower speaker is perfect for smaller spaces and is great for the home, office or bedroom. This 36 tall tower speaker is designed with 10-Watt powerful stereo sound. Built-in Bluetooth connectivity allows you to stream your favorite music wirelessly up to a range of 33 ft. This speaker also features a built-in digital FM Radio and digital volume control. ---Powerful 12-Watt 36 in. tall speaker tower ---Built-in Bluetooth wirelessly streams your favorite music from across the room, up to 33 ft. of range ---Features 3. BeFree Sound 5.1 Channel Surround Sound Bluetooth Speaker System. beFree Aound stand alone Speaker System with digital FM Radio features a built-in 4 high powered speaker system. This systems' four standing speaker towers generate amazing sound. CRAIG Tower speaker system Bluetooth®wireless technology . Shipped with USPS Priority Mail Legal Flat Rate Envelope. Built-in FM radio tuner. An attractive, floor-standing, wireless speaker solution with FM radio. Connect to music players wirelessly with Bluetooth® technology. 3.5 mm AUX audio connection. Weight (lbs). Features: Includes (2) Wakeboard Tower Speakers Waterproof Marine Grade Rated Construction Rugged & Weather-Resistant Housing Bluetooth Wireless Music Steaming Compact Mountable Design Built-in LED Illuminating Lights 2-Way Full Range Audio Speaker System Titanium Dome Tweeters Long Excursion Subwoofers Anti-Corrosion, UV Resistant Coating Integrated Universal Roll Bar Mounting Clamps Bluetooth Connectivity: Built-in Bluetooth Wireless Streaming Receiver Works with All of Today’s Latest Devices (Smartphones, Tablets, Laptops, Computers, etc.) Bluetooth Version: 4.0 Bluetooth Network Name: ‘Pyle’ Bluetooth Network Password: ‘0000’ (4 Zeroes) Wireless Range: 30’ ft. Condition is Used. Perfect for streaming music for an in-house party or a movie night! - User Manual. NEW Vivitar Bluetooth Tower Speaker. Style: Tower. 2 X 3 Long Excursion Speaker. USP Slot To Connect With Your Favorite Music. Vertical Design Fits Neatly In A Corner Without Sacrificing Great Sound Or Space. • Bluetooth Capability Streams Music Wirelessly up to 33 Feet Away. • Special Cradle Support Designed to Fit All Tablets, Smartphones and MP3 Players. • Powerful 20 Watt Stereo Sound. • Digital PLL FM Radio. SYKIK TSME26 Bluetooth Tower Speaker System FM Radio Subwoofer 2.1 USB Black NEW Step up to a higher quality in sound and design. This powerful Tower speaker carries a 6.5" sub-woofer along with a pair of 4" satellite speakers for deep and clear sound. Total of 60W RMS power (36 2x12) insures a great listening experience. The high gloss piano finish and high tech design demands complements from your guests. Play your music through Bluetooth, SD card slot (MP3), USB flash drive (MP3) or just connect through the 3.5mm AUX input jack. Full function remote is also provided for easy use. Sykik TSME26 2.1 Channel Bluetooth Tower Speaker System with Subwoofer Black REFURB Manufacturer Refurbished Step up to a higher quality in sound and design. This powerful Tower speaker carries a 6.5" sub-woofer along with a pair of 4" satellite speakers for deep and clear sound. Total of 60W RMS power (36 2x12) insures a great listening experience. The high gloss piano finish and high tech design demands complements from your guests. Play your music through Bluetooth, SD card slot (MP3), USB flash drive (MP3) or just connect through the 3.5mm AUX input jack. Full function remote is also provided for easy use. INNOVATIVE TECHNOLOGY ITSB-340 Bluetooth 16" Tower Speaker INNOVATIVE TECHNOLOGY ITSB-340 Bluetooth 16" Tower Speaker Manufacturer refurbished in Like New condition in original packaging with 90 Day manufacturer warranty. 30 Day hassle free returns The IT Innovative Technology Bluetooth Tabletop Tower Speaker with Black Grilles and Gray Veneer features a 16-inch tower speaker that stands on any entertainment system or tabletop. The modern black wood grain finish complements any home entertainment system components. The Bluetooth capability makes it easy to stream music from any Bluetooth-capable device and the 3.5mm aux input allows connecting any non-Bluetooth-capable devices. Product Details Brand it. One Powered Subwoofer with 8" Sub (H x W x D): 15.25" x 10" x 14.25". It utilizes a digitally tuned wooden enclosure for increased bass response. Built In Bluetooth Receiver. Two Front and Two Rear 3-Way Tower Speakers. Built in Bluetooth receiver. It utilizes a digitally tuned wooden enclosure for increased bass response. One Powered Subwoofer with 8" Sub (H x W x D): 16.375" x 10.25" x 15.25". Built In Bluetooth Receiver. Complete System! 90 Day Money Back Guarantee! Rockville TM150B Bluetooth Home Theater Tower Speaker System (2) 10" Subwoofers! Video of TM150B Demo video of TM150B This has everything built in! Each tower speaker has a tweeter, (3) full range speakers, and a 10” subwoofer built in. These have Bluetooth, USB, SD, FM radio, and all of the inputs and outputs you will ever need. Video of TM80C Demo video of TM80C This has everything built in! Each tower speaker has a tweeter, (2) full range speakers, and a 8” subwoofer built in. These have Bluetooth, USB, SD, FM radio, and all of the inputs and outputs you will ever need. Built in Bluetooth receiver. It utilizes a digitally tuned wooden enclosure for increased bass response. One Powered Subwoofer with 8" Sub (H x W x D): 16.375" x 10.25" x 14.5". Built In Bluetooth Receiver. Includes (4) Wakeboard Tower Speakers. Pyle PLMRLEWB47BB. (4) Bluetooth LED Marine Speakers. Bluetooth Wireless Music Steaming. Bluetooth Connectivity Built-in Bluetooth Wireless Streaming Receiver. Video of TM150C Demo video of TM150C This has everything built in! Each tower speaker has a tweeter, (3) full range speakers, and a 10” subwoofer built in. These have Bluetooth, USB, SD, FM radio, and all of the inputs and outputs you will ever need. 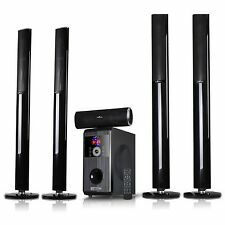 Rockville TM80W Bluetooth Home Theater Tower Speaker System+(2) 8" Subwoofers! Video of TM80W Demo video of TM80W This has everything built in! Each tower speaker has a tweeter, (2) full range speakers, and a 8” subwoofer built in. These have Bluetooth, USB, SD, FM radio, and all of the inputs and outputs you will ever need. Pyle - PHBT98PBK. 30-Pin Docking Station for iPod, iPhone, iPad. Bluetooth compatibility allows you to stream your favorite music or internet radio stations easily and wire-free. The blue LCD display is bright and crisp, and the matte black finish will add an elegant and clean design to your full ranged audio. This speaker system is sophistically designed, featuring a sleek look and smooth sound. 1.5 Tweeter. 5.1 Subwoofer. Bass unit:3 2 1 2 4. Powerful 20 Watt Stereo Sound. Bluetooth Capability Streams Music Wirelessly up to 33 Feet Away. Not all products are sent to the warehouse program. We reserve the right to use either. If your country differs, do NOT plug anything into a socket without use of proper adapter. Innovative ITSB-300-BLK Tower Stereo Bluetooth Speaker Black Piano Finish NEW. Condition is New. Sylvania SP386 BT Tower Speaker. Model: SP386. This Sylvania SP386 2.1 Channel Bluetooth Tower Speaker and USB Dock is in great working condition. Sylvania SP386 Bluetooth 2.1 Channel Tower Speaker With Built In Subwoofer. One Powered Subwoofer with 8" Sub (H x W x D): 16.375" x 10.25" x 15.25". Built in Bluetooth receiver. It utilizes a digitally tuned wooden enclosure for increased bass response. Built In Bluetooth Receiver. This reduces distortion and creates a sharper, more dynamic presentation in your movies and music. - Interlock Structure Our solid interlocking cabinet construction reinforces the cabinet in every direction. Bluetooth Capability Streams Music Wirelessly up to 33 Feet Away. If your country differs, do NOT plug anything into a socket without use of proper adapter. If you do so, and burn the system up, you are solely responsible. BeFree Sound stand alone Speaker System with digital FM Radio features a built-in 4 high powered speaker system. This systems' four standing speaker towers generate amazing sound. WARNING: This product can expose you to chemicals including BBP, which is known to the State of California to cause cancer and/or reproductive harm.